Maketu Coastguard's Henry and Andy. Suppplied photo. Maketu Volunteer Coastguard will represent Western Bay of Plenty District on a national stage later this month. Voluntary groups from around New Zealand will gather in Tauranga for the Trustpower National Community Awards from 29–31 March 2019. Joining them will be representatives from 25 other voluntary groups and organisations who were all named Supreme Winner at their respective regional Trustpower Community Awards. Everyone will come together to celebrate their achievements, learn from one another, and partake in friendly competition for the title of Trustpower National Community Awards Supreme Winner. 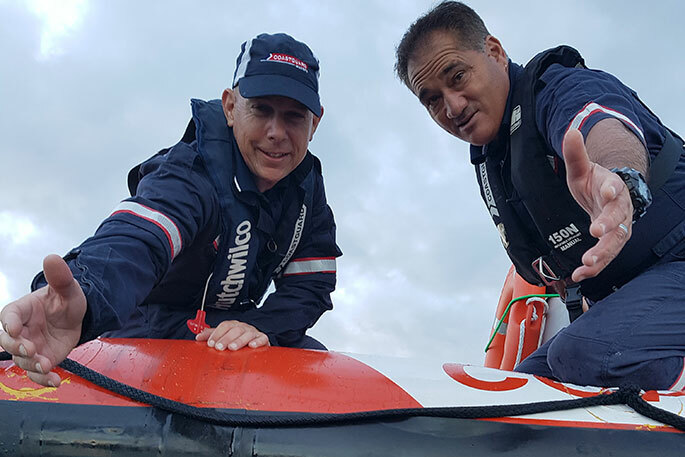 Maketu Volunteer Coastguard will give an eight-minute presentation sharing their story, their achievements, and why they deserve the title of the Trustpower National Community Awards Supreme Winner. Some of the guest judges this year include Rhodes Scholar and 2017 runner-up in the NZ Youth Volunteer of the Year Awards, Johann Go, co-founder of Good Neighbour, Cam Hill, GM of Tauranga Women’s Refuge, Hazel Hape, and previous National Supreme Winner, Bruce Knight, from the Edgecumbe Volunteer Fire Brigade. The presentations will take place on Saturday 30 March at Holy Trinity Tauranga. The Winner, Runner-Up and recipient of the Whetū Mātaiata Award will then be announced at an awards dinner that evening at Mills Reef. This year Trustpower will also be presenting a special award, the Trustpower Award, which will go to a group that embodies one or more of the values the company aspires to. These include the current P.R.I.I.D.E values (passion, respect, integrity, innovation, delivery, empower), plus a focus on continuous improvement. Groups will have the opportunity to network, share ideas, and take in some of the scenery from around the beautiful Tauranga Moana, which is also home to Trustpower’s head office. Trustpower community and communications advisor Abbie Siely says Maketu Volunteer Coastguard received recognition in their local competition for their efforts to fundraise for a new emergency rescue boat. “Maketu Volunteer Coastguard has devoted a considerable amount of time and energy to fundraising for a new emergency rescue boat. The achievement is particularly noteworthy because it was accomplished in addition to the group’s regular work educating the community about water safety and providing support services. "Coastguard runs local education events to empower people to take charge of their own safety at sea. For example, teaching boaties how to safely cross the bar. This annual event is in its fourth year, is completely free of charge, and has undoubtedly prevented accidents." The Trustpower National Community Awards Supreme Winner will take home a custom-made trophy by local Tauranga artist, Charlie Clegg, $4000 in prize money, a $1000 voucher from Exult (one of New Zealand’s leading training providers for the community sector), and a framed certificate. The Runner-Up will receive $2500 in prize money, a $500 Exult voucher, and a framed certificate. The Trustpower Award recipient will receive $1,000 in prize money, and a framed certificate. The Whetū Mātaiata Award (a group with strong potential who will benefit from additional support) recipient receives a framed certificate and a consultancy service package from Exult. Attending the Trustpower National Community Awards from Maketu Volunteer Coastguard will be Geoff Oliver and Shane Beech, along with Western Bay of Plenty District Mayor Garry Webber and his wife Carole Webber.